Back in August, I had a brilliant idea. I wanted to start a weekly blog conversation about the ways people purposefully put themselves into new places. I had a bad title (Walkin’ on Sunshine Wednesdays)…. and….. I forgot to write any other posts. Even more inconsistent was the fact that I didn’t even walk! So here I go again. The first Wednesday of the year, and my intention remains. I want Wednesdays to be the days I challenge myself to “go and grow” somewhere. It doesn’t have to be somewhere entirely new, but I want to take a photo, and then write a quick blurb about how I’ve been inspired. 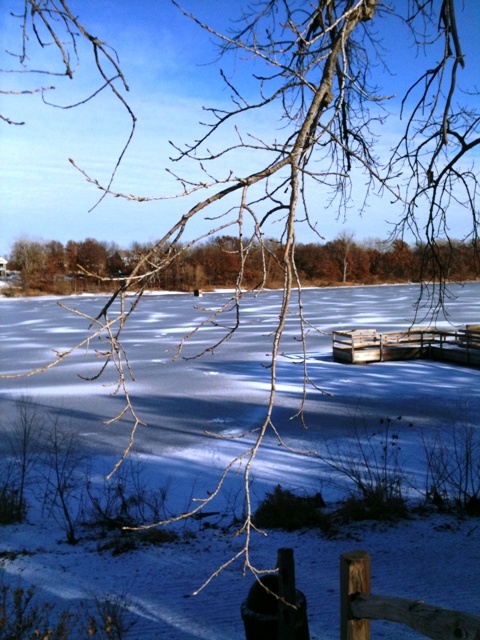 Today I went to the frozen version of Powers Lake. It’s the lake I walk all the time, but to watch its subtle changes through the seasons…I’m reminded how small I am, how little control I have over everything, and how I am meant to appreciate beautiful changes…both big and small. Plus, I just had to venture there today. It is 35 degrees and I saw four ice-fishing people. Maybe next week I’ll venture INTO one of the ice fishing tents. If not, I will still make the point of going to and documenting how I grow next Wednesday. If you send me photos, or a link to a blogpost, or a tweet with the #choosetogrow hashtag (see…even I can speak twitterese!) or a Facebook link. I will start to include other people’s Wednesday growth here too. I love this idea and I would never give up an opportunity to grow. I walked to a town that I had never walked to before and crossed this adorable bridge. And just for the record, those birds DID NOT move when I passed them. Sort of Hitchcockian. How do I attach my photo? I thought I was just dropping off my shirts when I got into a long talk with the owner of the laundry about parenting and the pros and cons of public vs. private school, and how it related to her stopping all use of non-organic chemicals in her business, and about cures for rashes that she learned as a child in the Caribbean… and before I knew it I was late, but a little bit expanded. There are so many luminous beings we run into all the time, and more and more I see that it’s not about what we do exactly, but rather about how we do it and the spirit we try to bring (even the spirit of honest ups and downs through our first Wed in January). I love this image…kinda makes me nervous to think about walking out on that lake. I spend a lot of time in the snow, and this year’s lack of it has made me think about how beautiful it can be when uncovered. Today’s post on my blog fits your format, I think: http://mamawolfe-living.blogspot.com/2012/01/uncovered-beauty.html. Usually on Fridays I use a photographic image to inspire me to write – I’m not sure if that’s what you are looking for.